While “foreigners” make up about 1% of the population in Shanghai — which is a huge concentration by China standards — we are still extremely rare in most of China. This leads to a great amount of curiosity about our lives. Since there are very few foreigners in my neighborhood, and even fewer foreigners who can speak Chinese fluently, I have begun to encounter what I call “frequently asked questions.” These are questions I have been asked within five minutes of meeting new people in my neighborhood. Enjoy. Every time I get a massage, this is one of the first questions that comes up. Chinese women tend to have much less leg hair than us Western gals, and they don’t tend to shave it. So when the massage girls start in on my legs, they usually let out a yelp of surprise, run their hands repeatedly up and down my leg, and then they ask what happened to all my leg hair. I’m not going to get into feminist politics right now, and I don’t usually get into it with them either. All I can say is, it just looks better to us. They usually think I’m sort of strange. Isn’t cultural exchange fun? Hey guys and gals! I’m only moderately sorry that I haven’t posted in several months. I’m sure by now most people have given up on me. The truth is, I’ve been a little busy participating in NaNoWriMo. For those of you who don’t know, that stands for National Novel Writing Month. The goal for participants is to write a 50,000 (about 175 page paperback) novel in the month of November. Today I reached my goal, making me an official “winner” of NaNoWriMo. Before you ask, no, I won’t tell you what it’s about. And no, you can’t read it. Even though I’ve reached 50,000 words, I’m far from finished. So… back to the bear cave for me! However, now that I’ve reached my November goal, I promise to start uploading content here again. Some of you smart people might want to raise the valid point that this excuse only works for why I haven’t posted in the last month, but doesn’t really explain the several-month hiatus before that. To you I say: I’m a writer, not a mathematician. I mentioned before that Jeff’s campus is overrun by cute stray cats. Evidence below. There are at least three cats right outside the frame. Can you spot all five kitties in the photo? As part of Jeff’s employment offer, we have a one-bedroom apartment in a building the university owns across the street from campus. Although it’s not up to American standards, it’s much nicer than my old Beijing apartment, and is a good apartment by Chinese standards. While several of the appliances have broken in the last week, the management is incredibly responsive and has fixed everything quickly. It doesn’t bother us much since we expect things to be unreliable here, but having good management can’t be over-valued. We live on the third floor (no elevator) and there are several other foreign teachers at the university who live in the building. It’s great to get to know the neighbors, who have been really helpful with tips and advice about the university, the neighborhood, and the city. Our combination living room/dining room/entryway. Came furnished, husband not included. Fairly large kitchen, complete with microwave. It looks like a lot of storage space, but most of the apartment’s piping and wiring isn’t in the walls, it’s hidden inside these cabinets, so less than half of the cabinets can be used as such. Bathroom/laundry room, with one of the only glassed-in showers I’ve seen in a Chinese apartment ever. Very plush! Bedroom with enough clothing storage for both of us — thank goodness that bit of matrimonial peace will prevail. Balcony view out across the way, where they are finishing a new building. It seems that very little progress is being made, since I’ve only seen a one or two workers laying down tile in one apartment for the last week. Balcony view east toward the street. We finally have internet in our apartment, so here’s a quick update of the last week. We get up in Santa Barbara and head to LAX, unsure of whether we will be able to get on a stand-by flight. Since Aunt Carla (lovely flight attendant pictured above) had trouble listing us on a flight, we aren’t sure we will have seats until we actually sink into the plush, expansive luxury of our business-class recliners. We are served a crazy amount of food (ice cream too!). It is the shortest 12-hour flight I’ve ever taken. Shanghai is not what we expect. Upon arriving, our baggage arrives without delay. The taxi driver doesn’t try to cheat us. People wait nicely in lines. The city is full of greenery and is actually rather pretty. There are international brands and restaurants everywhere in the city, and lots of other foreigners. Can this be China? Our contact from the school meets us at our apartment, and we discover that the air conditioning is not exactly working. It is 80+ degrees all night and as humid as the 24-hour sauna at the YMCA. Awake at ridiculous hour and find that people in our neighborhood like to do their errands at 6 a.m. Grab street food breakfast. Trek 1.5 hours to church via public transportation. Everyone is extremely nice and we go out to our first real meal in Shanghai. We have Italian and it tastes good. Yep, Shanghai is definitely different than Beijing. Attempt to get cell phone number for Jeff, and fail due to lack of passport. Wander around our neighborhood somewhat aimlessly until we find another store, and succeed in getting cell phone. Take taxi home, and discover that the hour-long walk we took needn’t have been so long. I am a delicious delicacy for the native mosquitoes. I’m afraid I’ll get deported as I look like I have a weird skin disease. Our contact from the school comes to the apartment to show us around campus and get Jeff set up with some paperwork. We enjoy a lovely lunch with two of the teachers, followed by a wonderful snooze. Locate bug spray at local store by pointing to itchy bites. Air conditioning gets fixed. Life is bearable once again. Work on furnishing apartment and finding our way around the neighborhood. Discover that there are 13 brothels along the 15-minute walk from the subway to our apartment. Visit People’s Square and discover that many of Shanghai’s tourist destinations are just extravagant malls. Feverishly clean grime out of apartment tile, consider what kind of person lived here before that they didn’t clean it when they lived here. Attempt to get the internet company to come install internet at our apartment. Am put off with promise that someone will call to set up an installation appointment within 2-7 days. Grumble. Shower head breaks, door buzzer breaks, gas stove breaks, hot water heater breaks. All aforementioned appliances get fixed by jolly repairman promptly. Head out for our government health exams, which we need in order to obtain residency. It’s a two-hour journey across the city, and we aren’t allowed to eat beforehand. Receive phone call forty minutes into trip from internet installation man, demanding to know why I’m not at home during my “installation appointment.” Argue with said man until he believes that nobody ever made an appointment with us for that morning. Obtain begrudging appointment for sometime in the afternoon. Arrive at hospital, sign lots of papers, obtain lots of red stamps, get blood drawn, eat snack, hop on train, get lunch, crash at home. Sleep like the dead until hot water heater repairman and internet installation man arrive simultaneously. Success on both fronts. Dinner out with friends goes so well that we miss the last train back to our neighborhood. Good thing taxis aren’t too expensive. So lately I’ve been going to the gym a lot — crazy, I know. But that’s not what this post is about at all. For the past several days, our office’s copy machine has been out of toner. It might not sound like a big deal, but as someone who makes about six trips to the copier a day, trust me, it is a huge deal. So anyway, the new toner finally came in the mail today, and I was just thrilled. I ecstatically skipped to the back room, toner in hand, and began fumbling around trying to get it into the copier. Realizing I had never changed a copy machine toner, I decided I should endeavor to follow the directions printed on the toner compartment door. So, my heart fluttering with anticipation, I vigorously shook the toner cartridge. 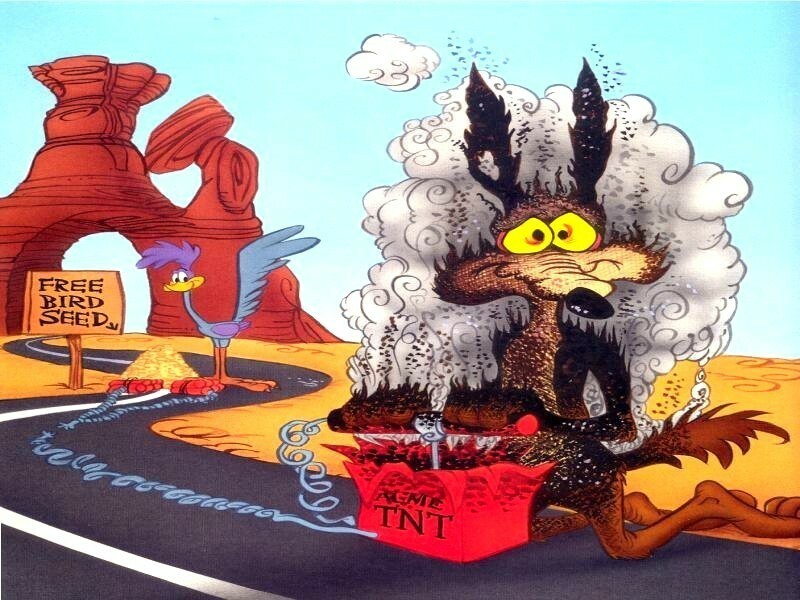 Toner flew everywhere — I looked like Wiley Coyote just after he falls into the old road runner TNT trap. I mean, I had toner on my hands, my neck, my face, and all over my crisp, white sweater. Not to mention all over the copy machine and break room. I guess most people don’t get as excited about new toner as I do, because the seal on the toner definitely couldn’t withstand my level of enthusiasm. Obviously this recalls the Great Ranch Dressing Disaster of 1993, when I accidentally shook a bottle of ranch too vigorously, covered half my plate in dressing, and cried inconsolably. However, in the years following the Great Ranch Dressing Disaster, I have come to realize that I do embarrassing and clumsy things too often to cry about them, and spent the entire day today laughing at myself. What a great day! What a great toner cartridge. My life is awesome. I totally think this sport is going to get big — it combines skating with hip hop. What’s not to love? Yesterday I went to my very first Maker Faire, which is sort of like Coachella, but instead of music it features lots of geeky inventions. At first, I thought it would be lame, but it was AMAZING. Maker Faire, sponsored by the ever-hip Make Magazine, is a huge festival where “makers” or DIY-ers” are invited to show off their crafts. It’s way easier to just show than tell, so enjoy the pictures below! A giant rocket ship — nonoperational I think. Gigantic tesla coil music and lightning show. It emitted 1 million volts apparently! One of several cupcake cars. You can actually sit inside the cupcake and drive around. The whipped cream and cherry are actually a little hat for the driver to wear. A Cyclocide ferris wheel — you could seriously die on one of these contraptions, but it was so fun! Doggy Diner, a San Francisco favorite! This was a hobby I’d never heard of. The group makes remote-controlled, scale replicas of World War I and World War II warships, complete with BB gun cannons, and battles them on ponds. It was pretty amazing, and the “Allies” team won! There were also more crafty booths at the faire, such as quilters, embroiderers, sewers, scrapbookers and letter presses. There were tons of other things I didn’t take pictures of, as well as lots of lectures by geeky folks on a variety of subjects. Even seeing the variety of people who went was worth the price of admission. There were steampunk types decked out in full steampunk fashion, there were “horseless carriage” enthusiasts wearing early 1900s garb, there were lots of goths, tons of geeks, animal costumes and even a few people dressed like they were going to a renaissance fair. It was so much fun, and I highly recommend going next year — I know I’ll be there! The boyfriend Jeff is currently in Honduras and will be in Central America for three weeks. If you’re interested in his battles against food poisoning, bugs and the language barrier, check out his blog at onthetables.com. Embarrassing fact: I LOVE Skymall magazine. I’m a frequent flyer, and it never gets old — I’m not one of those people who reads Skymall after they’ve exhausted all other options, I tend to pick it up as soon as I’m in my seat, and pore over every page, often rereading it later in the flight. Of course, I never imagined that among the electric nose hair trimmers, tacky garden statues and pet stairsets that I’d find something I needed to buy. Yet, about a year ago, I discovered in Skymall the dog DNA test. With a simple cheek swab and $70, the product promised to discern your dog’s breeding. Immediately I knew I had to have it. You see, my family has a very cute mutt dog, and her breeding a topic of frequent and bitter debate. Though the pet store advertised her breeding as “chow, lab-terrier,” my father insists she must be half golden retriever, and we have spent several hours a week debating this point for about ten years now. $70 is a small price to pay to irrevocably beat your dad in an argument, and so I purchased the DNA kit, hoping for long-overdue vindication. Finally the kit arrived, and the family gathered around to swab the dog’s cheek. Naturally, we all had to be present to ensure that neither side unfairly tried to skew the evidence. After a long wait, our results arrived — Chow was the clear winner, genetically speaking. The rest of the breeds the test picked up were Pomeranian and Husky, both of which are related to Chows. That was $70 down the drain. The last time I was on a flight, I noticed a new Skymall product, or I guess I should say, I noticed that they have repurposed the dog DNA test for humans. A friend of mine has tried the DNA test offered by National Geographic, which she strongly supported, but I have my doubts. After all, dogs have been much more carefully bred into distinct genetic types, yet this DNA test was pretty useless. I can’t help but wonder how accurate the human test can really be, but it is exciting to think about the future possibilities for learning family history with the swab of a Q-tip.